Hi All. This weekend I worked on something a little different for me, well actually two things. I made a notecard set and I started on a mini album (only the cover so far). I have had my eye on the Decorative Lamp set from Hero Arts for awhile, but have resisted buying it... until now! I finally dreamed up a project that required me to bring them home with me (that and stamps on sale + a coupon at Michael's). It took me a little while to be happy with the elements of the cards and get them to look like what was in my head, but after some experimenting I finally figured it out and was really pleased with the finished product. I had to make the box twice because I forgot to account for the size of the envelopes the first time. Whoops! I used the emboss resist technique on all the solid panels. Embossed the lamps with clear embossing powder then applied Distress Ink. For the patterned panels I inked up the Hero Arts Envelope Pattern stamp (my new favorite) first with a little bit of the same color that was on the solid piece and then covered the stamp completely with a darker shade Distress Ink. A few spritz with the mini mister and wha-la! Then I added some of the lighter ink to the edges to give it some more definition. The misting was they key. I was never happy with the background until I added the water to blend the inks and give me some of those bigger splotchier areas. Another first for me. I have a pile of things I have gathered to make a mini album for our honeymoon just sitting on my desk. 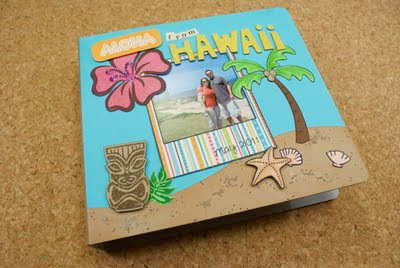 I am not a scrapbooker because well a big scrapbook page scares me! So I thought maybe, just maybe I could handle a mini book. Needless to say, I haven't done anything with it until now. I only made the cover so far. I'm pretty happy with it I think. What a darling set. 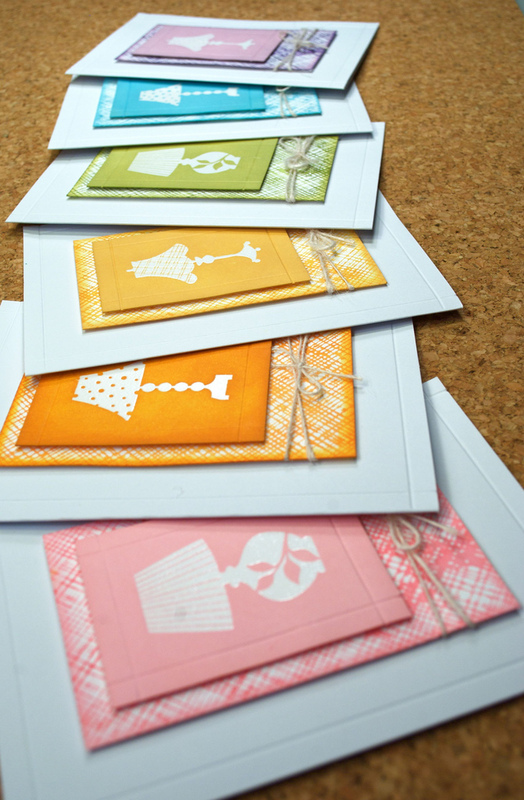 Love the different colors you used, they are so cheerful and I love the inked edges! OMG!!! I'm squeeling with delight!! 1st of all - the cards are amazing - they are all perfect!!! 2nd - you started your mini!!!! YAY!! It's beautiful so far!!! Can't wait to see more!!! Love your notecard set - the colours are fabby! Love this card set! I might have to make one inspired by it. 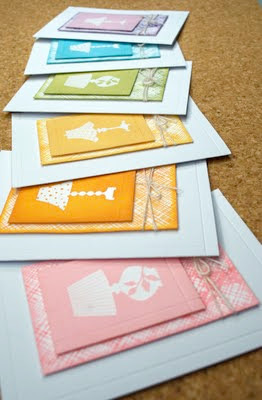 I love the idea of using the same distress ink + a darker one together on each card. Just lovely! Welcome to the thickers addiction, too. When I scrapbook, I use them allll the time for titles on pages. I've been on a card kick lately but am majorly feeling the urge to scrapbook now. Thank you for the inspiration! Ooh, these are fantastic! And a mini book too? You are on a roll! Your cards are so cute and I love those images. Really like how you put them together.